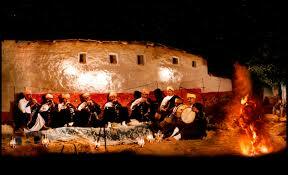 Journey to Joujouka - In the footsteps of Brion, William, Brian, Ornette and Frank. | Louder Than War Journey to Joujouka - In the footsteps of Brion, William, Brian, Ornette and Frank. Journey to Joujouka – In the footsteps of Brion, William, Brian, Ornette and Frank. On 10th June, we set off for the village of Joujouka in the Ahl Srif mountains in north Morocco to hear the Master Musicians of Joujouka playing the music of the festival of Boujeloud. The music is associated with the shrine of a Sufi saint, Sidi Ahmed Scheich but has been traced back to the Lupercalia, the Roman rites of Pan. Outside interest in this music can maybe be dated back to 1950, when writer, painter and more, Brion Gysin, visited the village. He described the music and festival as, “the Rites of Pan under the ragged cloak of Islam”. Gysin in turn introduced the writer William Burroughs to the village and the musicians, who Burroughs described as, “… a 4000 year old rock ’n’ roll band ….listen with your whole body, let the music penetrate you and move you and you will connect with the oldest music on earth”. Now jump forward to 1968, when Brian Jones of the Rolling Stones visited Joujouka. Then In 1970 he released the first record of the musicians, “Brian Jones Presents the Pipes of Pan at Joujouka”. Saxophonist Ornette Coleman later recorded with the musicians. There are numerous CDs and records now available of both the Master Musicians of Joujouka and of the Master Musicians of Jajouka – more of which later. Our journey to Joujouka takes us to Paris and Madrid and then across the Mediterranean to Tanger, where the connections to Joujouka grow stronger. Brion Gysin opened a restaurant, The Thousand and One Nights, there in 1954, where he presented the Master Musicians and other traditional Moroccan musicians specialising in exorcism and trance. The Thousand and One Nights is long gone but you can still find good music in Tanger. We go one evening to the rooms of Les Fils du Detroit, who play ancient music of Al Andalus – the Arab kingdom which covered most of Spain. The musicians play as and when they feel. Guests walk into the rooms, no admission charge. You will be offered mint tea and should leave a tip or perhaps buy a CD. Watching Les Fils, we meet David Holzer, a freelance writer who is going to the Boujeloud festival for the third time. This year, he will read some of his work at a short event to mark the centenary of William Burroughs’ birth. “Every year since 2008, the 40th anniversary of Brian Jones’s visit to Joujouka, an intimate festival is held in the village.There are plenty of reasons why the festival is unlike any other you’ll experience but one is that it’s a festival in reverse: a small number of people watch the same band for three days. Up close. So, when you come to Joujouka for the festival, you’re not just following in the footsteps of Paul Bowles, Brion Gysin, William Burroughs, Brian Jones and some of the world’s most challenging artists. You’re experiencing the unique healing power of the music of the Masters in its purest possible form”. Taxis take us up to the village – all 50 of us. Fifty is the limit for this festival. We are billeted in houses around the village. We and two other couples stay in the house of one of the musicians. For the next three days, we enjoy leisurely breakfasts at the house before making our way to the stage area. In the afternoon, the musicians play in a fairly low-key way, featuring violins, small bamboo flutes called liras and hand drums. We enjoy two excellent meals a day at the stage, shared with the other guests and the musicians. (A word of caution: the meals are excellent if you are an omnivore, somewhat repetitive if you are a vegetarian and vegans are advised to bring their own food to cook!). After the evening meal, usually around midnight, the full complement of musicians return to the stage in their uniform outfits and play the ritual music. The line up now consists of 6 or 7 playing rhaitas, double-reed instruments a little bit like oboes, and as many drummers on a variety of hand drums. Gysin described, “Fifty rhaitas ….. (blowing) sheet lightning to shatter the air”. The numbers may have decreased but the musicians still blow up a storm. The rhythms are complex and driving and rhaitas may be the loudest known acoustic instruments. The call and response of the rhaita players and the telepathic switches of tempo are astonishing. Sitting just a few feet from the Master Musicians as they play is an overwhelming experience. On the second and third nights, a bonfire is lit. Boujeloud appears dressed in goat skin, dances and lashes out at people with olive branches. Young men dressed in women’s clothes dance the part of Crazy Aisha Kandisha, who was falsely promised as bride to Boujeloud in the legend / myth. The musicians invite watchers up to dance. Many people are here for the second, third or more times. It is a friendly and mixed crowd which includes several musicians, musicologists and writers. There is no tourist infrastructure in the village. This year, there was mains electricity but no mains water yet. However, a reservoir was being built at the time of the festival. The electricity and reasonable road are both relatively new features. So Joujouka is moving into the 21st century as the King of Morocco has decided to invest funds in the north of the country. The income from the festival doesn’t go towards infrastructure but is a welcome contribution to a village which is still essentially a farming village. There is time to kill between breakfast and the start of music. We wander up the road one day and notice some grander houses further up. On another day, two young men, both called Mohammed, take several of us up to the cave which legend holds was Boujeloud’s cave. Pictures of this cave appear on a number of CD booklets. Monday morning, a fleet of taxis awaits to take people back to the station at Ksar el Kebir. Some people are heading south to Fez and Marrakech. Most, like us are heading back to Tanger. We now realise why we were advised to travel 1st class. The journey from Tanger had been fine but we spent the journey back standing in a hot, crowded corridor. From Tanger, we catch the ferry back to Tarifa in Spain and journey on to Cordoba, Barcelona, Paris and home to Manchester.